Therapy with oligonucleotides: the delivery issue. Antisense and siRNA oligonucleotides have tremendous potential as therapeutic agents in cancer and other diseases. However, despite recent advances in oligonucleotide chemistry and pharmacology [1-3], the effective delivery of these molecules to their intracellular sites of action within tissues remains a key impediment to progress . Antisense oligonucleotides usually act via selective degradation of complementary pre-mRNA through recruitment the nuclear enzyme RNase H, while siRNA loads on to the cytoplasmic RISC complex to monitor and ultimately degrade fully complementary mRNA; thus both antisense and siRNA provide powerful means for down-regulation of gene expression [5-6]. Additionally, antisense molecules can be used to shift patterns of pre-mRNA splicing , or to regulate gene expression via antagonizing miRNA . All of this can be done effectively in cell culture via potent transfection agents such as cationic lipids or polymers. However, because of toxicity issues, these approaches are sometimes not readily adapted to the in vivo situation. Thus much of the animal experimentation and clinical investigation to date using antisense or siRNA have been done with oligonucleotides administered in 'free' form, without any transfection reagent [6, 9]. However, although there has been much progress, many researchers in the oligonucleotide therapeutics field believe that the efficacy of antisense or siRNA could be substantially enhanced by use of appropriate delivery systems [10-11]. Recent investigations from our laboratory [12-13] and others [11, 14] have stressed the value of using various forms of receptor-mediated endocytosis as an cell entry pathway for oligonucleotides. Via this general approach, substantial increases in cellular uptake, intracellular delivery, and pharmacological effects have been attained. Integrins as targets for oligonucleotide delivery. Members of the integrin family of cell surface adhesion receptors seem particularly attractive target for enhancing the efficiency and selectivity of delivery of antisense and siRNA oligonucleotides. The integrins are a family of heterodimeric cell surface receptors that have important roles during development and in the adult organism . One of the major function of integrins is to provide mechanical transmembrane linkages between extracellular matrix proteins such as fibronectin, collagen and laminin and the actin cytoskeleton . Integrins also play an important role in regulating several signal transduction pathways [17-19]. In particular, our laboratory has explored the connection between integrins and the Erk MAP kinase mitogenic pathway [20-22]. A number of integrins are differentially expressed between tumors and normal tissue [23-24], with the integrin αvβ3 being of particular interest in this context since it is highly expressed in angiogenic endothelia and in some types of tumor cells [25-26]. It is known that integrins are recycled via endocytotic processes [27-31]; thus the αvβ3 integrin is thought to be primarily internalized via caveolae and/or lipid raft-rich vesicles [32-33]. A number of integrins, including αvβ3, then traffic through the Rab 11 positive perinuclear recycling compartment prior to returning to the cell surface [29, 34-35]. Thus integrins are relatively abundantly expressed (typically ~105 copies per cell), are efficiently internalized by endocytosis, and some members of this family are differentially expressed on tumor cells; in aggregate these characteristics suggest that targeting integrins could be an excellent approach for delivery of therapeutic oligonucleotides. Direct conjugation of functional agents such as cell penetrating peptides (CPPs) to oligonucleotides allows enhanced cellular uptake ; thus direct conjugation strategies have an important position in drug delivery approaches. Because many integrin ligands, including RGD, are peptides, the conjugation techniques for CPPs should be applicable to conjugation of integrin ligands. A typical approach  for conjugation is formation of stable chemical bonds with reactive groups in both molecules, such as thioether, disulfide, amide, oxime and hydrazone. Recently, a technique with click chemistry [38-39] has been also developed. Up to now, there are only a few reports of direct conjugation of integrin ligands to oligonucleotides. Defrancq and colleagues [40-45] have reported on various conjugates with linkages of thiazolidine and oxime. An oligonucleotide with an aldehyde moiety was coupled to RGD bearing a cysteine residue for thiazolidine formation, and an aminooxy group for oxime formation (and vice versa) (Fig 1, a). These effectively reacted without a protection strategy and under mild aqueous conditions. We also reported a direct conjugation of a bivalent-RGD that had a strong binding affinity to integrin receptors . The bivalent-RGD conjugated oligonucleotide was successfully synthesized by formation of a thioether linkage with a maleimide group in the bivalent-RGD and a thiol group introduced into the 5'-terminal of the oligonucleotide (Fig 1, b). Thus, this strategy, which directly conjugates integrin ligand to oligonucleotide, has a great advantage from the viewpoint of simplified synthesis. In our hands integrin-RGD conjugates have been a valuable tool for oligonucleotide delivery. Thus we used a bivalent form of RGD to target an antisense oligonucleotide to αvβ3-expressing human melanoma cells  (Fig 2). This oligonucleotide was designed to correct splicing of a luciferase reporter cassette that contained an aberrant intron, thus up-regulating luciferase expression and providing a positive read-out for oligonucleotide delivery. The RGD-oligonucleotide produced a several-fold enhancement of effect as compared to unmodified antisense. The mechanism of uptake seemed to track the caveolar uptake pathway known for the αvβ3 integrin, while eventually some oligonucleotide was delivered to the trans-Golgi. Recent work has suggested that the RGD—oligonucleotide and the unmodified oligonucleotide enter cells by completely different endocytotic pathways . Molecular model of a bivalent-RGD peptide conjugated to an antisense oligonucleotide. Cationic lipids have a long history as gene delivery carriers . Lipofectamine, DOTAP, Geneporter, DOTMA, to name a few, have already been commercialized and widely used [48-49]. They form complexes with nucleic acids, also called lipoplexes, mainly through charge-charge interaction and hydrophobic forces . At physiological pH, the internal structure of the lipoplexes are laminar, onion-like, with nucleic acid layers sandwiched between lipid bilayers as determined by small angle x-ray scattering and transimission electric microscopy [51-53]. The lipoplexes usually have a positive surface potential. Thus the unmodified lipoplexes enter the cells through endocytosis, as observed by electron microscopy . However, this process is nonspecific. To preferentially deliver the lipoplexes into cells specifically expressing αvβ3 integrin, targeted lipoplexes were prepared through incorporating RGD peptide. The formed targeted lipoplexes improved the delivery of functional genes or siRNA into various cell types including HUVEC, HeLa, 293T, NIH3T3, A549, U87, MDA-MB-231, human airway epithelial cells, human tracheal cells, and activated platelets [55-64]. Incorporation of polyethylene glycol (PEG) shielding is essential to introduce stealth-like properties [65-66]. Lipoplexes modified this way become less susceptible to uptake by phagocytes and it also reduces the nonspecific interaction toward negatively charged sulfated proteoglycans on the cell surface, thus allowing long circulation time [67-68]. Adding targeting moieties to stealth-like lipoplexes is expected to achieve high delivery specificity. PEG is widely used to provide shielding for delivery systems because of its biocompability, neutrality, hydrophilicity, flexibility, variable length and bulky hydrodynamic volume [69-70]. Martin-Herranz et al. extensively explored the influence of PEG chain length on lipoplex properties . X-ray scattering found that incorporation of PEG with molecular weights 400 (PEG400) or 2000 (PEG2000) did not change the internal laminar phase of DOTAP-DNA complex. However, only PEG2000 provided sufficient shielding, which was evidenced by reduced inter-lipoplex interaction leading to blocked aggregation, and by interrupted cell-lipoplex interaction showing reduced transfection efficiency in fibroblasts. These authors further discovered that the shielding effect of PEG was less dependent on PEG density. For example, PEG400 even up to 20% ratio to cationic lipid didn't introduce effective shielding. However, PEG2000 completely shielded lipoplexes at a 6% ratio. Thus PEG with molecular weight above 2000 is widely used in developing long-circulating lipoplexes [63, 72]. Besides providing a protective coat, it also acts as tether for targeting ligands to develop targeted lipoplex delivery systems [57-58, 64]. Recently, Wang et al. developed an integrin targeted lipoplex and tested its siRNA delivery efficiency in a mouse tumor model . This targeted lipoplex utilized a novel multifunctional lipid carrier abbreviated as EHCO to form complexes with anti-HIF-1a siRNA; the intent was to knock down HIF-1a, which is a key transcription factor responsible for tumor survival in hypoxic environments. RGD in the form of cyclo(RGDfK) was conjugated to PEG with molecular weight 3400 and directly linked onto the surface of this lipoplex through reaction between a maleimide group (-Mal) group on PEG and free thiol (-SH) groups on the EHCO. The molar ratio between targeting ligand and lipid carrier was 2.5%. For in vitro delivery in U87 cells, flow cytometry, confocal microscopy, and luciferase assays consistently demonstrated that PEG effectively reduced the nonspecific cell entry of the lipoplex, while RGD increased the receptor mediated delivery and the activity of the loaded siRNA. This RGD-directed lipoplex was then systemicaly delivered into athymic mice bearing human glioma U87 xenografts via intravenous injection using anti-HIF-1a siRNA dosed 2.5 mg/kg. At day 14, after five doses of siRNA, the tumor volume of the mice receiving targeted lipoplex was much smaller than the mice receiving nonmodified lipoplex with significance (P < 0.05). This result validated RGD-directed stealth-like lipoplexes as an effective systemic nucleic acid delivery system. It should be pointed out that delivery targeting integrins could achieve dual effects, with delivery of nucleic acids to both αvβ3 integrin-expressing angiogenic epithelial cells and αvβ3 positive tumor cells [64, 73]. RGD-surface-modified nanoparticles, including polyplexes and liposomes, have been utilized to deliver therapeutic genes for a decade . However, adenovirus, with a diameter of 60-90 nm and using integrin as a secondary receptor for internalization , can be considered as the first integrin targeted nanoparticle. Seeking to emulate the superior transfection efficiency of adenovirus, polyethylenimine (PEI) was conjugated directly to the integrin-binding peptide CYGGRGDTP, which was then condensed with plasmid DNA to form particles 30-100 nm diameter . PEI-RGD/DNA complexes showed superior in vitro transfection efficiency compared to those with RGE in the peptide sequence , representing an initial success in mimicking adenovirus for gene delivery. Further work sought to overcome the intrinsic problems of PEI polyplexes, such as non-specific binding to cell surfaces and serum proteins. Polyethylene glycol (PEG) was used as a spacer between RGD and PEI, and then the RGD-PEG-PEI polymers were condensed with plasmid DNA [77-78] or siRNA . The presence of PEG groups forms a hydrated barrier surrounding the nanoparticles that shields the defects in the cationic polyplexes and inhibits non-specific adsorption. Besides improvement of the in vitro activity, the latter study showed that RGD-PEG-PEI particles accumulated in tumor tissues overexpressing integrins and selectively delivered VEGFR2 siRNA to suppress tumor growth and angiogenesis . Recently, RGD-contained polymers have been further optimized. Polycation/DNA complexes were coated with multivalent N-(2-hydroxypropyl)methacry­lamide (HPMA) copolymers in one study . 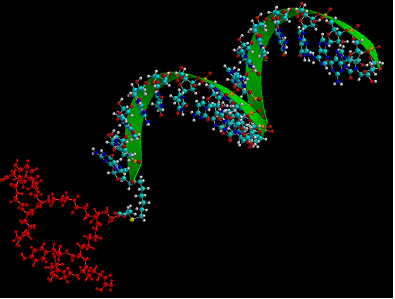 In another study, RGD-PEG-block-poly(lysine) was synthesized for gene delivery . Interestingly, condensing with this polymer did not enhance the cellular uptake of plasmid DNA, but improved expression of the plasmid dramatically in HeLa cells displaying αvβ3 integrin . Initial studies suggested that the presence of RGD peptide changed the intracellular trafficking route of the PEI polyplexes to a caveolar-mediated pathway followed by trafficking to the perinuclear region, thereby avoiding lysosomal degradation of delivered genes . Although the proposed mechanism was intriguing, the methods in this study, which heavily relied on microscopic observation, were descriptive and non-quantitative. Utilizing pharmacological and molecular inhibitors of endocytotic pathways can provide mechanistic information of intracellular trafficking of nanoparticles . Other than PEI, RGD has also been conjugated to other polymeric carriers for delivery of nucleic acids, for example, carbon nanotubes , dendrimers , albumin , and gold nanoparticles . Inspired by the clustered RGD ligands displayed on five penton-base proteins in adenovirus, multiple RGD ligands were conjugated to gold nanoparticles to form so called RGD nanoclusters, and then were condensed with DNA/PEI complexes ; the polyplex demonstrated superior in vitro activity. Another interesting RGD-based particle involved albumin conjugates (Fig 3), in which splice-shifting antisense oligonucleotides and PEG-RGD are linked to the same albumin molecules . The resultant complex (diameter of 6 nm) was smaller than most nanoparticles, and may obtain a better balance of avoiding being scavenged in the liver versus retention in tumor sites . Compared to direct conjugates between nucleic acids and RGD ligands, polymeric carriers have a higher cargo capacity, which may lead to a better pharmacodynamics. The binding affinities of RGD peptides to integrin are typically at nanomolar levels, for example, 16 nM for the binding of a bivalent RGD peptide to the αvβ3 integrin . For delivery of the same amount of therapeutic nucleic acids, direct conjugates have more RGD ligands thus possibly saturating integrin receptors and resulting in inefficient receptor-mediated endocytosis. Another important factor affecting pharmacodynamics of nucleic acids is intracellular trafficking, from cellular uptake, vesicle trafficking, to release of the cargo at the target sites. Initial studies have indicated its importance [13, 81], however, more pharmacological and cell biological studies are needed to elucidate the molecular mechanisms of nucleic acid trafficking. 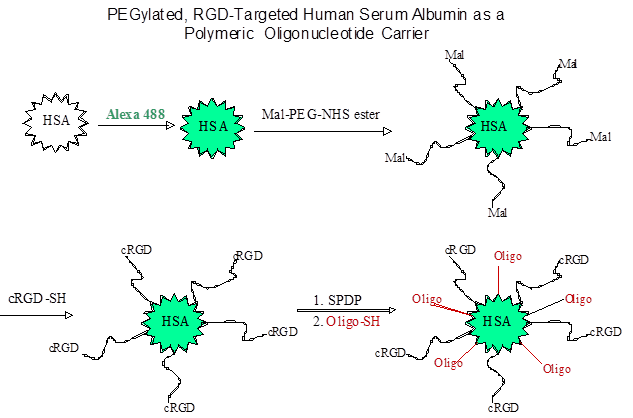 Synthesis of an RGD targeted carrier for oligonucleotides using human serum albumin. Dendrimers are spherical macromolecules with numerous inner branches, and are attractive molecules for the delivery of various types of nucleic acids (e.g., antisense oligonucleotide, siRNA, and plasmids) as well as traditional small organic molecules [85-91]. As a delivery modality for nucleic acid, dendrimers have many advantages in terms of molecular structure, size and surface functional groups . Particularly, by selecting the generation of dendrimer, the size of dendrimer/nucleic acid complexes is adjustable to less than 200 nm, which is an important factor for tissue distribution through capillaries (~5 um) and passage through fenestrae between discontinuous endotherial cells (30-500 nm) of liver, spleen and bone marrow . Cellular delivery of nucleic acids by dendrimers has been limited in its effectiveness as well as in vivo efficacy. Excessive positive charge on dendrimer surfaces causes cytotoxicity due to non-specific interactions with negatively charged proteins on cell membranes [94-95] Also interactions with various serum proteins during blood circulation can disrupt delivery function, damaging nucleic acid before it gets to the target by the action of the endo/exo nucleases in blood . The mechanism for dendrimer internalization in cells has been generally considered to be receptor mediated endocytosis which follows an endosome/lysosome pathway. However, recent studies indicate that cellular internalization of dendrimers is diverse and cell type dependent with different internalization pathways in different cells . Clathrin-coated pits, macropinocytosis, the caveolae-dependent pathway, and clathrin- and caveolin-independent pathways were reported for the cellular uptake and transport of dendrimer/nucleic acid complexes [97-100]. For endosomal release of dendrimer and nucleic acid into cytoplasm, protonation in the acidic pH and Cl- ion influx in the late endosomal stage induces rapid swelling of the polymer matrix as well as conformational change, following by endosomal rupture thereby releasing nucleic acids into the cytoplasm . A recent study by Lee and Larson revealed a pore formation mechanism by the positively charged dendrimer . Dendrimers caused the formation of holes on the cell membrane leading to nonselective internalization into cell. The endocytotic pathway of RGD-dendrimer conjugates is little known and needs further investigation. Our previous studies with RGD carriers indicates that initial uptake of nucleic acid complexes by integrin receptors was followed via smooth vesicle trafficking, not clathin-coated pits, and at later points the complexes entered into endomembrane compartments [11-12]. The surface amino groups of dendrimers can be modified by attaching molecular ligands for selective targeting, for example, to recognize certain receptors expressed in disease sites [102-106]. The αvβ3 and αvβ5 integrins have been of particular interest since they are highly expressed on the luminal surface of endothelial cells during angiogenesis and also certain types of malignant cells [19, 107]. High-affinity cyclic RGD peptide, (c(RGDfK)) selectively recognizing αvβ3 and αvβ5 integrin receptors was chosen to attain high affinity binding to this receptor . PAMAM dendrimer-RGD conjugates complexed with siRNA enhanced the siRNA delivery and reduced the progression of angiogenesis in the treatment of solid tumors [83, 109]. Pegylating the dendrimer surface shields positive charge of the dendrimer thus reducing nonspecific interactions with cell membranes and attenuates oxidative stress on the cell [110-111]. Also pegylation increases the circulation time of the dendrimer in blood by avoiding the interaction of dendrimer surface amino groups with serum proteins [112-113]. Prolonged circulation time in blood enhances the drug accumulation in diseased tissues (tumor or inflammatory site) via the EPR (enhanced permeability and retention) effect [114-115]. Dendrimer-RGD-pegylation is a well-designed delivery adjunct that improves target selectivity as well as stability of the dendrimer complex with nucleic acids. Efficient intramuscular gene expression was mediated by PEG-conjugated PAMAM dendrimer [116-117]. The intracellular codelivery of nucleic acids and traditional chemotherapeutic drugs using dendrimers can be a promising approach for the development of multifunctional-drug carriers. With targeting ligands attached, the nanospace of the dendrimer interior can be used as a vehicle for encapsulation of chemotherapeutic agents (e.g., doxorubicin or paclitaxel) while the outer shell just beneath the dendrimer surface serves for nucleic acid shielding from the action of endo/exo nucleases . In recent study a generation-3 (G3) dendrimer was conjugated with PEG and RGD for codelivery of doxorubicin (DOX) and siRNA. Doxorubicin (DOX) was coupled to the RGD targeted nanoglobule via a degradable disulfide spacer to give G3-[PEG-RGD]-[DOX]; G3-[PEG-RGD]-[DOX] was further complexed with siRNA . The siRNA complexes of the targeted conjugate resulted in significantly higher gene silencing efficiency in U87-Luc cells than those of control conjugates G3-[PEG-RGD] and G3-[DOX]. Kang et. al. evaluated the efficiency of folate-polyamidoamine dendrimer conjugates (FA-PAMAM) for the in situ delivery of therapeutic antisense oligonucleotides (ASODN) to inhibit the growth of C6 glioma cells. ASODN from the FA-PAMAM knocked down EGFR expression in C6 glioma cells, both in vitro and in vivo . Quintana and colleagues synthesized an ethylenediamine core PAMAM dendrimer generation 5 which was covalently conjugated to folic acid, fluorescein, and methotrexate . This complex provides targeting, imaging and intracellular drug delivery capability with 100-fold decreased cytotoxicity over free methotrexate. Other multifunctional dendrimers have been prepared by covalently linking tumor targeting molecules such as folic acid (FA) or HER2-antibody, a sensing fluorescent molecule, and a chemotherapeutic drug such as methotrexate or taxol [103, 119-120]. While these latter examples do not involve integrins, they establish approaches that could also be used in the integrin targeting area. The integrin family of receptors provides interesting and useful targets for delivery of therapeutic oligonucleotides. Much has already been done using simple RGD peptides associated with a variety of carrier types (lipoplexes, dendrimers, other polymers). Additional peptide or small molecule ligands for non-RGD binding integrins are becoming available and should open the way to target additional members of this large receptor family. Finally, while many reports have appeared, we still know relatively little about the mechanisms involved in integrin-mediated delivery of nucleic acids; this will be an important theme for future investigation.